Ever had a sight so amazing that you try to take it all in faster than your brain can process it? 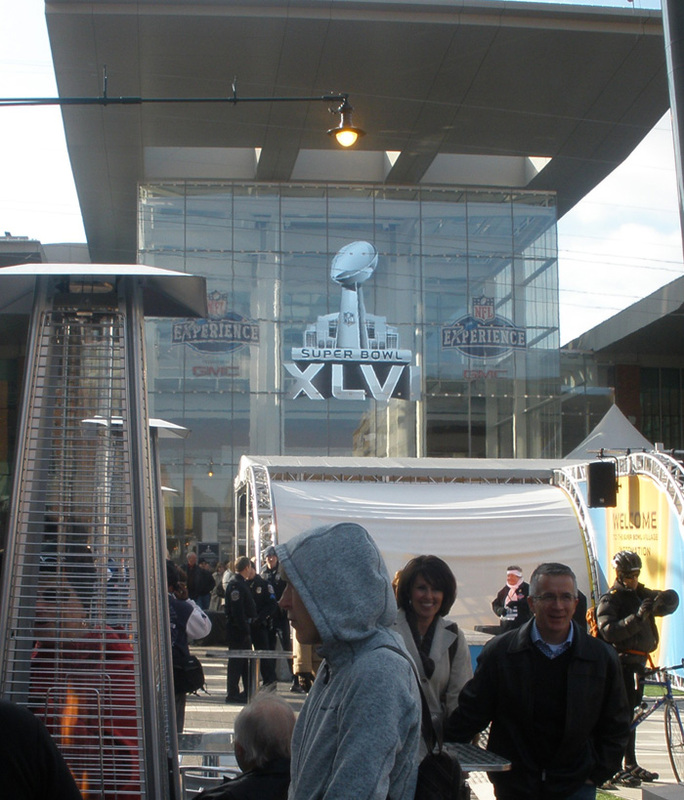 Well, I had that experience this past weekend with my wife and 4-year-old son in Downtown Indianapolis at the NFL Experience in the Indiana Convention Center. 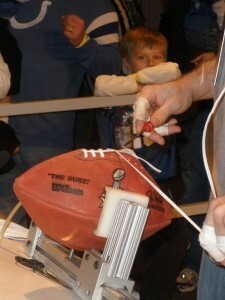 The NFL Experience is just one of many Super Bowl-related activities I will be writing about over the next week. Others to look forward to include Super Bowl Village, zip lining over Capitol Avenue and Media Day. We also will continue to have plenty of coverage about what is going on out here in Hendricks County, including things to do, places to eat and information about our extension of the Downtown festivities, our Super Celebration Site at Metropolis Shopping Center in Plainfield. 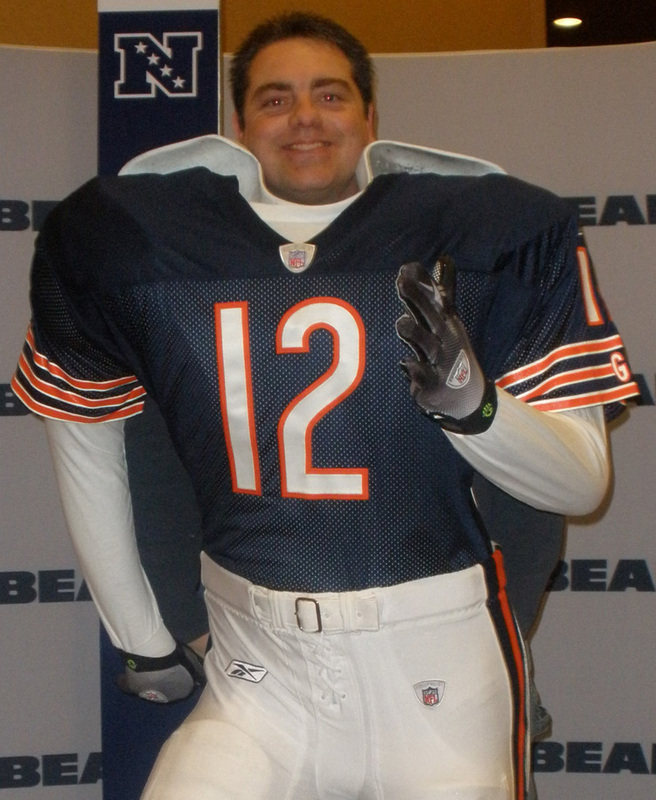 But as for today’s topic, the NFL Experience, I don’t even know where to begin. For a huge NFL fan like me, this was an opportunity I will never forget. I really don’t know who was more excited me or my 4-year-old who just kept saying as we were headed into Downtown, “I can’t believe we’re going to the Super Bowl! This is going to be incredible!” My wife made sure to temper our excitement as we arrived reminding us we had to first turn in our waiver forms to get our NFL Experience wrist bands. This is critical for anyone who wishes to participate in anything active at the NFL Experience. If you print and fill out the waiver form ahead of time, it saves a lot of valuable “play” time inside the NFL Experience. After we secured our bracelets, we had to stop at a kiosk that featured our favorite team, the Chicago Bears! Lined one after another in the Convention Center’s front hallway, every team is represented by a life-size figurine with the head conveniently missing so that you can climb up behind and get pictures of yourself as if you are a real football player. From there, I gave into my own desires and followed my son to the Rush Zone, which featured everything a young football fan could ever dream of. My son got to kick Nerf balls over miniature goal posts, throw and hike footballs to player cutouts and even jump around in a football shaped bounce house. He then experienced the ultimate resistance. Called The Drive, kids put on a heavy vest and are strapped to a large bungee cord. They run as hard as they can until the bungee snaps them back. My son loved it, and we couldn’t stop laughing as we watched him. But without a doubt, his favorite interactive experience was a football obstacle course called Mini Camp. He got to jump over, run under and even barrel over a few dummies as he raced other children through this football maze. He ran that course so many times that we literally lost count. Before we left the Rush Zone, we got one last treat as Indianapolis Colts wide receiver Reggie Wayne made an appearance and threw passes to children and then signed some autographs. I can’t express in words what it was like for a dad to get to see his 4-year-old having such a blast, but now it was my turn. I tested my arm strength, accuracy and velocity in various passing stations. I tried my hand (or in this case my foot) at kicking field goals. You could test your knowledge and climb under the hood like an NFL official, visit a replica locker room, learn how a football is made from leather to lace and so much more. As I waited in line for one of the interactive stations, it hit me. The NFL Experience literally is like an NFL amusement park. In addition to all of the above, there was live musical entertainment, food (that just like amusement parks was way overpriced), a shopping area featuring NFL and Super Bowl XLVI gear, football memorabilia that left me mesmerized including game-worn jerseys, helmets and other items from the Pro Football Hall of Fame, Super Bowl rings and the famous Vince Lombardi Trophy. This truly was a once-in-a-lifetime opportunity, a football lover’s paradise and a must see if you plan to be in Central Indiana this week!